Ticketmaster plans to roll out facial recognition. What could go wrong? Concertgoers will soon live in their own personalized version of hell above and beyond the Ticketmaster convenience fee. Live Nation, Ticketmaster’s parent company, recently announced a pilot program to ditch tickets in favor of advanced facial recognition technology. For the pilot, Ticketmaster partnered with Blink Identity, a Texas-based biometric company that previously worked to implement biometric security programs in both Afghanistan and Iraq. The company claims it can make a positive ID in “half a second,” even if those being scanned aren’t looking directly at its cameras. Once scanned, the system flies through a potential database of tens (or hundreds) of thousands of attendees in an attempt to make a positive ID. Only then will it grant entry to the event. Replacing physical (or digital) tickets with advanced biometrics systems, as you might have guessed, isn’t without its critics. Facial recognition technology has the huge potential to be used as a routine mass surveillance tool. It’s a little bit like using dynamite to dig into your garden. It can be used on people without their knowledge, let alone their permission. China recently rolled out a similar system. Though its facial recognition database is meant to be used by law enforcement, not concert venues, it was recently used to nab a fugitive wanted for “economic crimes” among a group of 60,000 concertgoers. And while no one would argue that catching a fugitive or two in large groups is a bad thing, the greater implications, at least in China, are of these identification systems being used to identify political dissidents and ethnic minorities. While China’s use case might seem far-fetched as it relates to Ticketmaster, it might not be as big a stretch as you initially thought. 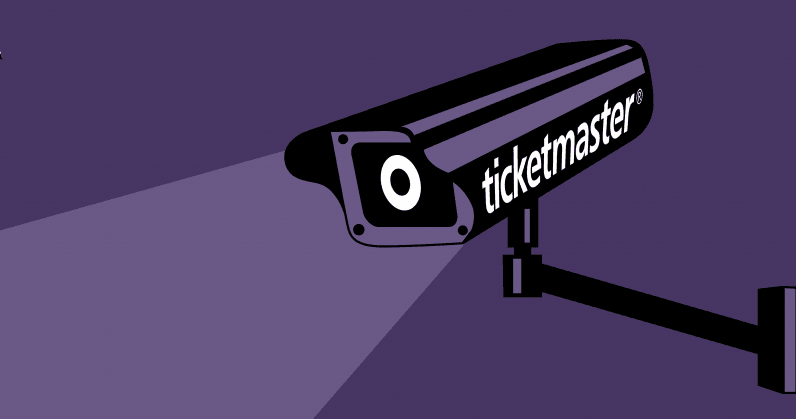 Unlike China, Ticketmaster would be building a database with the full consent of its users. It foregoes the type of diplomatic shame and 1984 references that typically accompany dragnet security measures. Don a tinfoil hat with me for a second as we explore a famous quip from an S.E. Meyer novel, Origins. I will leave you all with this thought. You won’t have to force any of these new objectives on anyone. When the time comes, your citizens will beg for it. And if you’re okay with our future databases being built on the backs of convenience, rather than by force, then you also have to be okay with the potential for bad actors to access it. Whether government organizations or hackers, bad actors will, at some point, access the data you provide. See: Equifax, Target, Bank of America, Yahoo, Facebook, and dozens of others that you’ve probably relied on at some point to keep you secure from these types of attacks. Once accessed, it’s a foregone conclusion that users within these databases will be sorted to meet the needs of those accessing the data. Whether it’s a Cambridge Analytica-type company sorting us into voting profiles to steal the next election, or something even more nefarious. In our current political climate, which is largely fueled by nationalist rhetoric with xenophobic and racial undertones, it’s not difficult to imagine databases of political dissidents, immigrants, or religious minorities tagged for easy identification by government operatives. At some point we’ll have no choice but to hand over biometric data for travel, employment, or housing. For now though, we’re willfully handing it over for the sake of convenience. So I ask: how much risk are you willing to accept to save a few minutes in line?